Veteran teachers share a list of "must have" items with new teachers. ​Suggestions of items new teachers should have. A guide from the US Department of Education. Use this virtual layout tool to help you design customized and effective classrooms to promote learning. 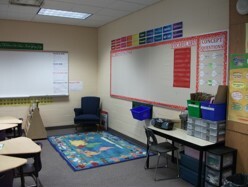 Rearrange and set up mock classrooms and map out virtual seating charts. ​Click here for ideas on how to organize classroom materials. A place where new educators can come together to network, learn skills, and connect with other members in the profession. ​NEA's edCommunities is a place where teachers, parents, school support professionals, and community members share ideas and resources to improve student success. It is free and open to all! The Stomach Bug Book is a booklet designed to inform and educate school personnel on norovirus, the spread of the disease and disease prevention, and provide helpful resources for the school community. Tomorrow's Teachers is an annual magazine for NEA student members. It offers a wealth of resources to those new to the teaching profession. Each issue offers help with job searches, provides classroom tips for surviving the first year in the classroom, recommends strategies for parental and community outreach, and much more. Click on the magazine image to read the latest issue. This 1 hour session offers an overview of the PRAXIS I test. Participants will review content, test taking strategies, and test anxiety. This session will review each content area: reading, writing, and mathematics.